as dynamic wrinkles can form. That’s why a wrinkle injection is needed. In the early stages of wrinkle formation the use of localised muscle relaxants can assist in the prevention of deeper wrinkles. Muscle relaxing injections decrease wrinkles in a different way than filler wrinkle injections such as, hyaluronic gel filler, collagen or fat injections do. A facial muscle relaxant is a substance injected in small amounts into an area to block the nerve impulses to the muscles, inhibiting their ability to contract. This can prevent the formation of new wrinkles and relax existing wrinkles thereby reducing their appearance. 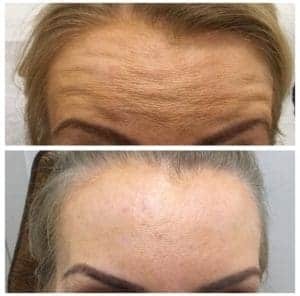 More recently we have found that Muscle relaxing wrinkle injection around the eyes can prolong the results of laser resurfacing of wrinkles in this area. The effect of the muscle relaxing wrinkle injection takes three to five days to occur. 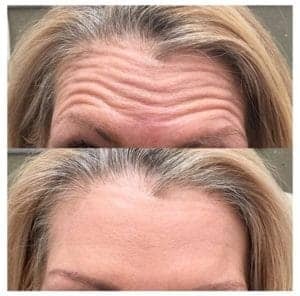 Patients know it is working when they see a decrease in the wrinkle and can either no longer move the muscle / create the lines or find it much harder to do so. The results last 3-6 months. As the effect wears off, wrinkles return, but often not as severely. With each subsequent wrinkle injection, the effects can be more prolonged. The techniques mentioned for softening wrinkles are often used individually or together. The best technique for you depends on several factors, including location of the wrinkles, cost factors and general health considerations. Our staff can help you decide if muscle-relaxing injections are right for you. We believe that best results are seen when skin rejuvenation therapy is combined. Today there are many noninvasive light sources and therapies that can help make the skin surface appear smoother, refreshed and tighter. Dr Lanzer finds that combining treatments is effective and may suggest treatments such as microdermabrasion, Revlite, Aura, Isolaz, Portraite or Dermaxel Fractional Laser. Are Facial Muscle relaxing injections safe? It is now one of the most common cosmetic procedures and is extremely safe. There is slight pain on injection and the treatment often takes less than one minute. Which areas are commonly treated? Crows feet on the sides of the eyes, the glabella frown lines and the horizontal forehead lines. More recently lip lines from pursing the mouth and down turned corners of the mouth are treated. It is also used for eliminating excessive sweating under the arms and prominent muscle bands on the neck. Do the effects improve with time? Yes. Often effects last longer with each repeated injection. If injected very close to the upper eyelid it may cause a temporary lid droop or changes the shape of the eyebrow. Patients should be aware that there may be bruising. Transient headaches have occurred and patients should not be pregnant and should not suffer from neurological diseases. How long does treatment take to do? The injection takes less than 1 minute. How can I enhance the results? Often skin rejuvenation treatments will compliment muscle-relaxing treatments. Daily use of sunscreen is essential in any anti ageing regime. One of the most common facelift treatments for aging of the face today is muscle relaxing injections also known as anti-aging injections or anti-wrinkle injections. These injections fall into 2 groups. Firstly, are injections aimed at relaxing and stopping dynamic movement of the facial muscles. Secondly, are injections used to fill defects and make it a more convex curvature shape. The muscle relaxing injections work via blocking the release of enzymes in the path of the nerve conduction to the muscle. As a result, facial movement is reduced in particular areas. Some people have a tendency to overact certain muscles. This is particularly seen in the area between the eyebrows called the glabella. As a result, a person may have a constant frown. This is often referred to as the “11” sign because of the 1 or 2 prominent deep vertical lines. People often complain that others tell them that they look angry when they are not. Although it is important to have facial movement in order to indicate facial expression, sometimes the over-contraction of the muscles for no real reason portrays a false perception to other people. When injecting the glabella area, the practitioner will place the injection into the deep muscle belly on either side of the frowned depression. They will also continue the injection in a lighter form above the upper eyebrow in order to relax the associated muscles. The procedure will take just a few minutes and the results will last for 3-6 months. The effect gradually reduces and the patients would then return for a touch up. There is some evidence to suggest that treating patients repeatedly may lead to a reduction of the frown line and less injection material would be required in the future. Also, treating people at a younger age will reduce the actual tendency for the crease to occur and therefore is considered preventative. Other areas that are injected are the smile lines or the crow’s feet. Smiling is a wonderful thing and laughter is certainly therapeutic to the general well being. However, one does not need to crease the skin on the outer eyes to feel happy. Some patients have a constant squint so that the skin is always in a wrinkled state. 2 or 3 small pricks in this area can lead to a smoothing and relaxed effect of the lines. It is important to also protect one’s skin from the sun in the future and also to consider sun glasses which may also reduce squinting. The other areas of the body that we treat with muscle relaxants include the lines across the forehead. One needs to take particular care in this area not to go too low as this could lead to dropping of the actual brow. There are methods of reversal of muscle relaxants if required. An increasingly large amount of patients now opt for Wrinkle Injection procedures. Muscle relaxants can also be used on the muscles of the neck, on the wrinkles of the upper lip and also are for the smile region. If you’re looking to remove wrinkles from the face, get a free consultation at Melbourne Wrinkle Injection clinic with Dr Lanzer. One of the most common uses of muscle relaxants today is for hyperhidrosis. This is when patients have had many years of excessive sweating in the armpits – axillae. As a result their clothes are simply wet. This can be very distressing factor for people and quite embarrassing. Fortunately today, muscle injections can almost stop this sweating and can certainly bring it into the normal range. The injection is partially covered by Medicare and can be performed up to 3 times a year. Generally, the results last for 6-9 months and occasionally 12. The injection takes not more than a few minutes and there is a little bit of pain associated with each prick. Other devices can be used to reduce sweating. This includes Ulthera or the Viva. Due to Therapeutic Goods Administration (TGA) laws about advertising trade names in Australia over the Internet, it has become necessary to label some treatments products with different names. Please call us on 1800 444 333 for more information. All photographs represent one person’s experience, and results may vary for each patient. All photographs are of actual patients of Dr. Lanzer. The visible change in these photographs has occurred as a result of the procedure/s undertaken. Best results are obtained when the procedure is combined with a balanced diet and exercise. Some facelift before and after photos shown are not exact, in that they vary in light, contrast, clothing, background, and distance from camera, hairstyle and make-up. Dr. Lanzer can email all patients a detailed consent form which provides information related to the surgery. This information is made available to all patients before surgery, allowing enough time for the patient to ask any questions they may have.